I have been practicing my make up, although i wear it everyday i dont really do my eyes as much as this everyday obviously! And excuse the eyebrows!! Am trying to grow them a bit!!! LOL...And excuse the weird poses...i was trying to capture the colours so i remember how i did it!!!! Thank you! I am trying to sort out the other pics, and those bloody adverts drive me nuts!!! Let's hope that worked! And the adverts dont cover it again! Thanks ladies! Obviously my eyebrows will be better on the big day and my spots and bits will be properly covered! I am cringing at how big they came out, i dont want to look vain or anything. I was mainly wanting to get the eye colour right and seem to have done a pretty good job so far! It's nice to get other peoples views on it so i can see how others will think of it. Thank-you for your kind comments! 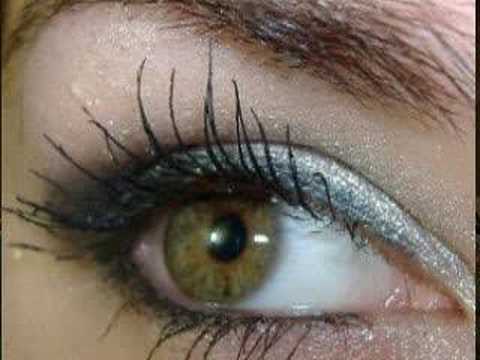 lovelyeyes, well blended colours and i love the sparkle of the eyeshadow. which brand did you use? love the lips too!! Thank-you! I used a trio pallete of eyeshadows by Rimmel, a white, a silvery grey and a black. And lipstick is Loreal a shade called "lingerie" i wanted a natural colour lipstick and it goes nicely with the eye colours. I love the eyes fab!!! **Blushing** thanks so much!!!! you have all been so sweet!!!!!!! It does look a bit greeny, but it was a silvery grey with black on the outsides. I do often wear greens as it goes with my brown eyes. OOh i'm loving all the compliments! i have never been complimented so much in one day!! !